Cucurbit vegetables come in many different shapes and sizes: from giant pumpkins to miniature gherkins, and although they all need a healthy nutritious soil, they have their own little growing preferences. 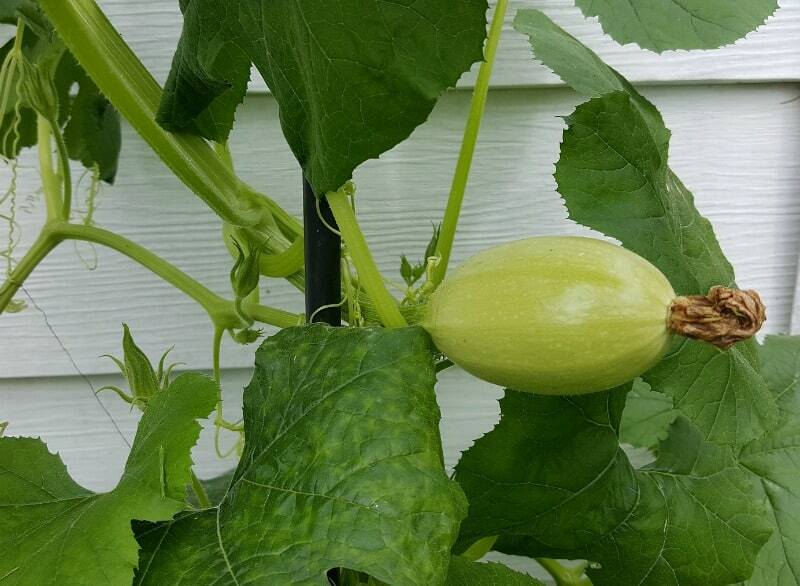 Many cucurbits are climbing, some like to trail, and others are happiest staying wherever you planted them. 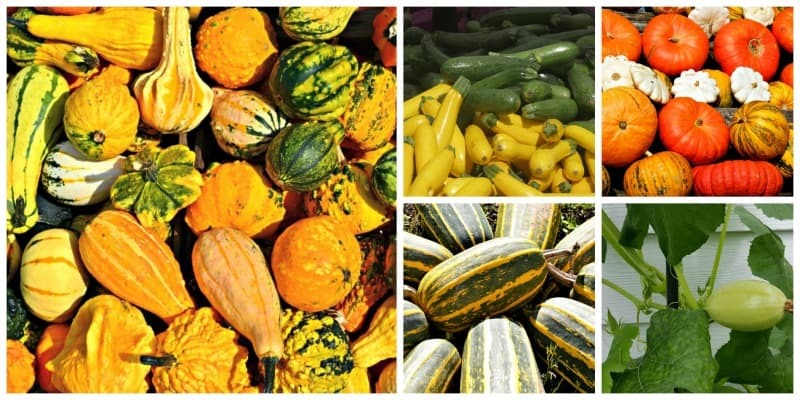 There are the cucurbits that prefer the heat, and there are the varieties that thrive in cooler weather. Without doubt, the cucurbits are one of my favorite garden groups. They provide our fmaily with some great additions to salads, pasta dishes and the BBQ. They will also help to feed us in the winter with a mass of home-made soups we freeze. 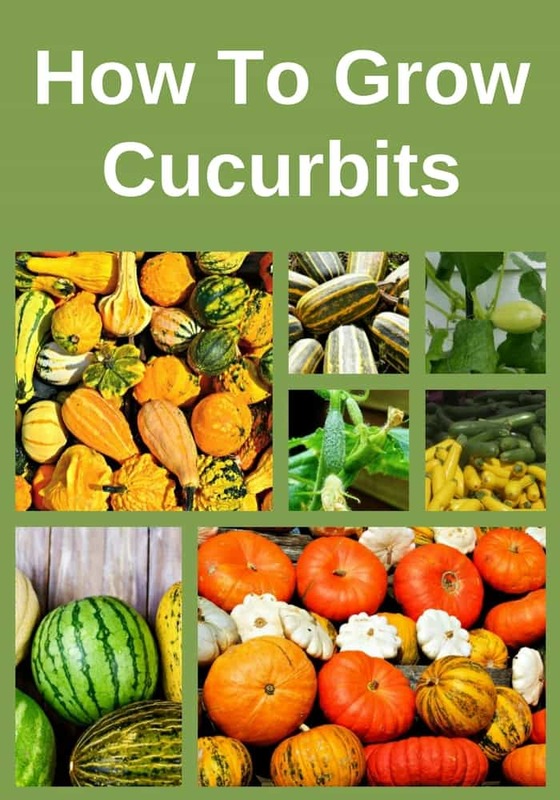 Here is a list of cucurbit vegetables as well as some growing help and advice. Depending on their variety, you can sow pumpkins in pots during April or directly in the ground mid-May. They need a lot of trailing area, so when you plant leave 30 inches to a yard between plants. Harvest as late as possible when the foliage has died back, and before the first frost. 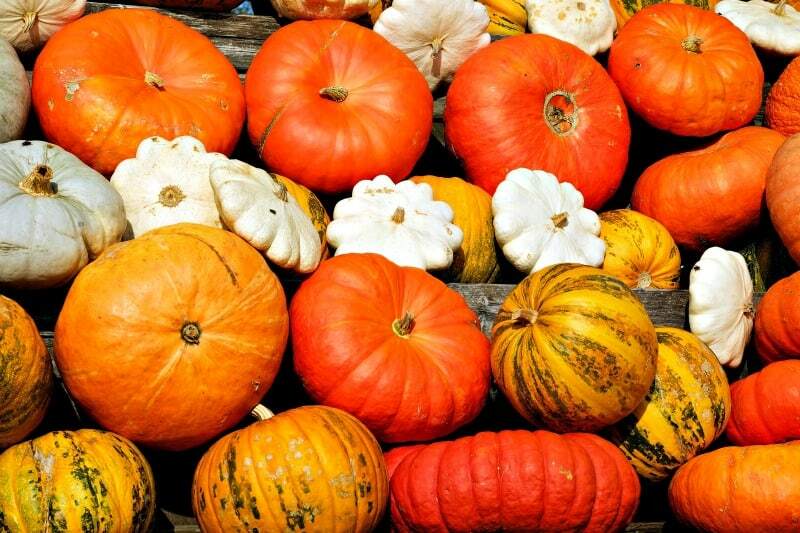 There are many varieties from the orange Halloween type to giant pumpkins, that can grow over 1000 lb, to little colored varieties that are great for stuffing and roasting. Whatever variety you grow, you should lift the fruits onto a board or pallet as they start to grow. If the ground stays wet hey can rot. If fruits are not setting, use a paintbrush to agitate the flowers to pollinate them. 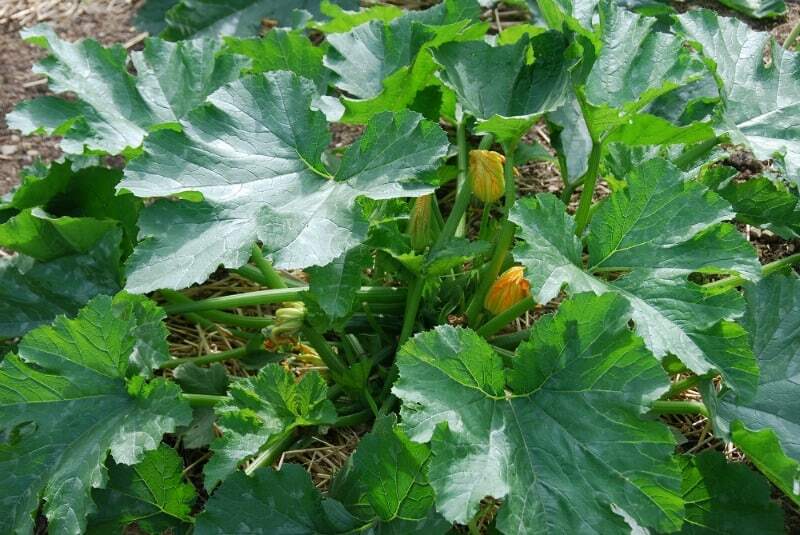 Growing marrows is similar to all other cucurbit vegetables: make sure to allow about 3 feet between each plant. The popular green marrow is probably the best known although there are different sized and colored varieties now on the market. 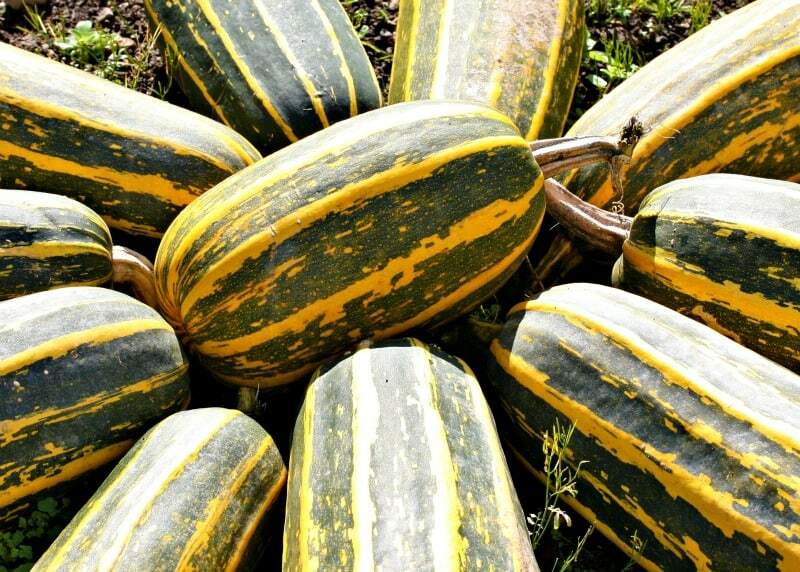 Marrows are a bit larger and longer than zucchini, and they can range in color from light to deep green. Courgette plants will need at least 40 inches of space as they tend to get quite big. A generic name for quite a variety of cucurbit vegetables, squash can come in various shapes and sizes. Summer squash tend to be quite small, have soft skins, and don’t store well. Winter squash is harvested late in the fall, and some varieties can be stored for up to six months. They include varieties such as the bottle shaped butternut squash, the pumpkin shaped dumpling squash and the stringy spaghetti squash. One of our favorite crops to grow, cucumbers do much better outside in the garden (we tried them in the greenhouse and they did poorly). Outdoor cucumbers are easier to grow and have a much better flavor. Sometimes male flowers would cause bitter taste to fruits so it was good practice to remove them. This has been bred out of most varieties, so when choosing cucumber seeds choose F1 varieties. Gherkins are small cucumbers and can be grown in much the same way. Drying your own gourds is a very simple process: just leave them on the vine, even after the leaves of the mother plant have withered. Once the gourd becomes light, it’s ready to be cleaned and decorated. What can you make with gourds? They make beautiful fall decorations, but can also be used as ornaments. You can even make vases and bowls for autumn decor. 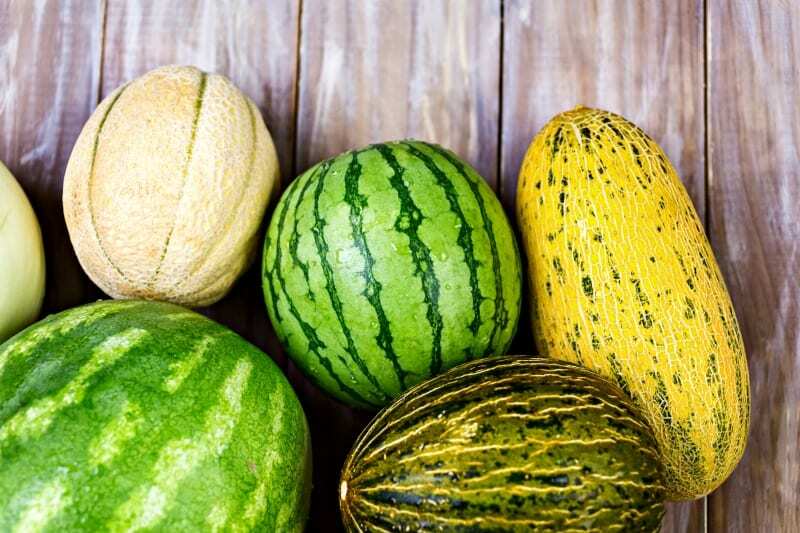 While having completely different origins, Watermelons & Musk Melons are both grown in a similar way. For a reliable crop they will both need to be grown in the greenhouse. The watermelons can get quite big and will trail over the floor of the greenhouse, while the musk melons can be trained to climb. Cucurbit vegetables tend to either produce many small fruits or fewer very large fruits, but either way they will need a lot of nutrition to help them achieve this. Preparing the bed for these vegetable plants is relatively straight forward; we tend to empty the contents of our compost bins and wormeries into this area of the garden, as it provides plenty of fertilizer and allows the soil to hold more water. We would also dust in some general fertilizer such as blood meal fertilizer. The plants in this vegetable group need a lot of space sicne each plant can produce a lot of fruit. Do not be tempted to sow too many seeds. 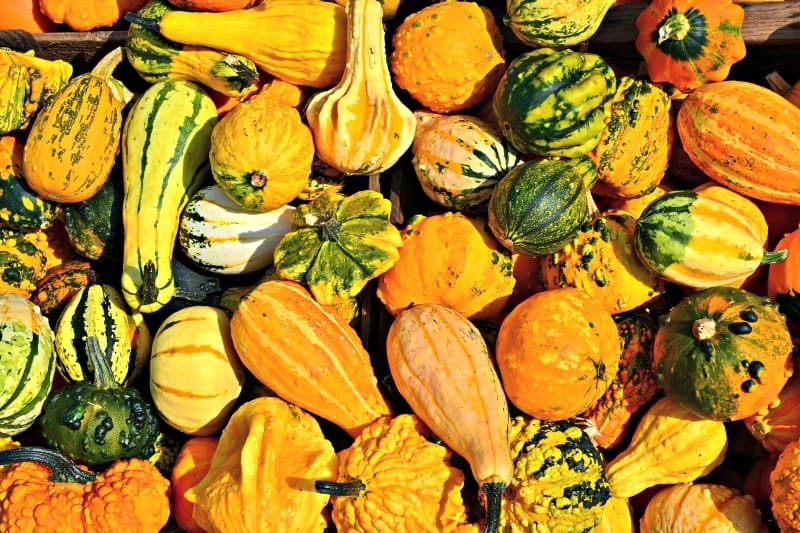 Think in terms of spacing courgettes, pumpkins and squashes at one yard intervals. It may also be worth planting through a weed control fabric, as once these plants spread out they will cover a lot of ground. We love zucchini, so we tend to grow four plants, marrows we tend to miss out, two large Howden type pumpkins will be enough for a few meals and plenty of soups for the freezer. One cucumber plant should be enough, as should one butternut squash. The compost we talked about earlier should provide enough nutrients for the plants to establish. But once your plants flower, you’ll need to add some phosphates, as flower and seed production is fueled by this nutrient. As the flowers appear it is a good idea to provide a weekly high phosphorous liquid feed. A liquid tomato plant food is great, but even better would be a homemade comfrey tea. We grow comfrey, cut the leaves three or four times a year and allow them the rot down producing a black odorless liquid, we dilute about 20ml of this liquid to a watering can of water and feed it to the base of the plants. Cucurbit crops are one of the easiest and most rewarding vegetable crops to grow. They have high germination rates, they grow quickly and they reward you with an abundance of fresh garden vegetables. I like to sow the seeds straight in the garden, a few weeks before the last frost. Makes it easier and I think it strengthen the plants. Of course, if you wish you can use a propagator to germinate. A warm windowsill would be fine too. As soon as the seeds germinate and are beginning to get established, you can move them to a greenhouse. Depending on the weather you may need to pot on the seedling to a medium sized pot, if it is still cold then it is not worth the risk of planting out to early and the seedling will perform better kept protected in a larger pot. As soon as the weather has started to feel a little warmer start to harden off the seedling and plant into its final growing position. When planting cucurbit crops you need to follow the spacing recommendations for each crop, so make sure to follow the seed packet advice. Pick cucumber and zucchini when the fruits are relatively small: they taste much better, and your plants will keep producing. Even when you’re careful to pick them small, sometimes a marrow size one will surprise you. The pumpkin and squash crops may need to be limited (remove dome of the fruit). this way the energy goes into three or four large pumpkins or six to eight butternut squashes (check out these delicious butternut squash soups), rather than having a lot of poor looking fruits. Read your seed packets for the best advice on the variety that you are growing. 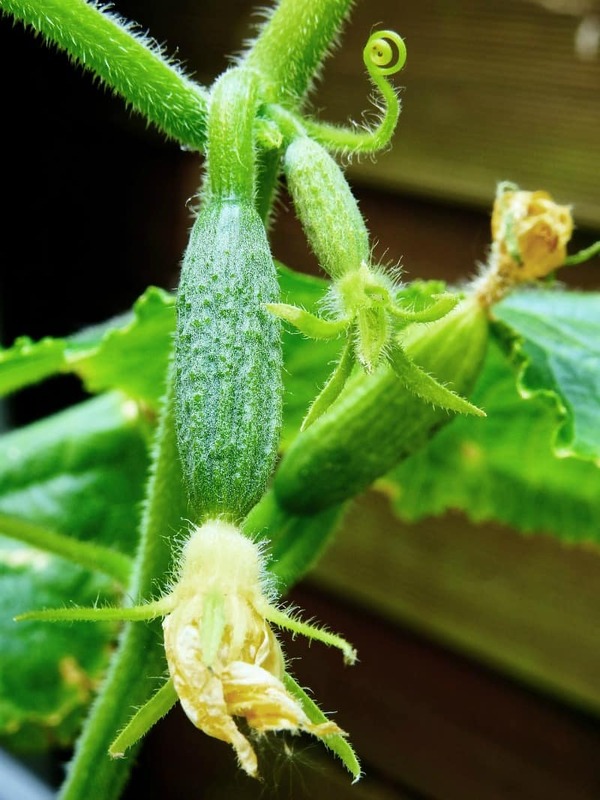 While cucurbits are relatively trouble free, powdery mildew seems to be quite common. This is a fungus that attacks the leaves leaving a white dusty powder on the leaf surface. To control an attack of powdery mildew, make up a 3:1 mix of water and milk, remove the affected leaves and spray the remaining plants every other week, this should help to keep this fungus in check. 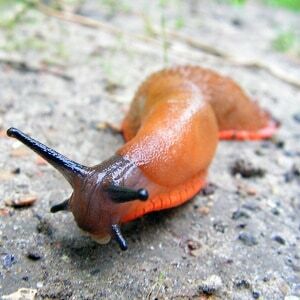 Slugs can also be a bit of a problem, especially if they get near the fruits. Just keep your usual slug controls in place, and make sure that you remove any softening fruit. Cucurbit crops can also be infected by the cucumber mosaic virus. You can recognize it by the yellowing of the plants leaves as well as stunted growth. Although rare, this disease is worth looking out for as infected plants must be destroyed before the virus spreads to other plants. The cucumber mosaic virus is carried by aphids, so as long as you have a good aphid control strategy, then you should avoid this virus.